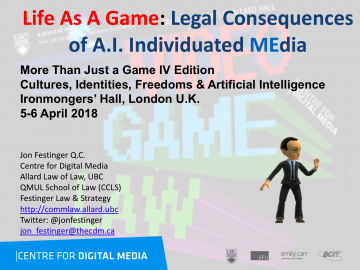 » Peter A. Allard School of Law » Home » 2018 » April » 08 » “Life As A Game: Legal Consequences of A.I. 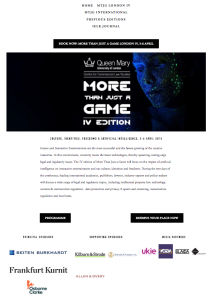 Individuated MEdia” @ More Than Just Game lV, April 5, 2018, London U.K. 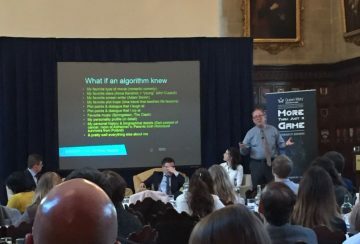 This past week I once again had the pleasure of giving a talk at fourth annual “More Than A Game ” conference in the U.K. As seems to always be the case, the ideas for the talk were germinated during this course as well as during Video Game Law during the fall semester. So considerable thanks are in order. 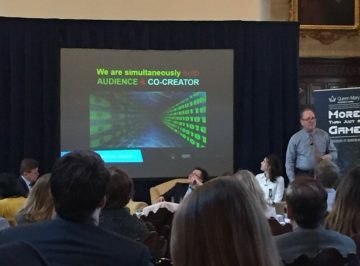 As promised, here are my slides. Will post video when available.